Can animals evolve in response to climate change? One of the concerns with climate change is that rate of evolutionary response by animal species will be unable to keep up with the rate of climate change itself. This is a legitimate concern as species diversity plummets due to climate-driven alterations to the environment. However, for the first time, scientists have shown that climate change itself has altered natural selection in a wild population and that this selection led to changes in the frequency of a genetic trait. In other words, climate change caused evolution. 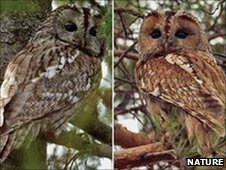 Now researchers in Finland have documented a case of microevolution in tawny owls (Strix aluco) that can be attributed to climate change. [iii] The study conducted by Dr Patrik Karell from the University of Helsinki, published in the journal Nature Communications, shows that that shorter winters and decreased snow cover have changed the frequency with which the different colour morphs (dark and pale) occur. The tawny owl is a robust pigeon-sized woodland owl with a range that includes most of the temperate regions of Eurasia. The species exhibits two distinct colour morphs: brown morph (dark) and the grey morph (pale). In keeping with Gloger’s Rule, the dark birds are most prevalent in the humid climate of western Europe. In eastern and northern regions, the pale variety dominates. The bird’s colour is genetically determined through simple Mendelian inheritance, with the brown colour being dominant. Studies have shown that the pale owls are fitter of the two morphs in regions that exhibit snow-rich winters; as snow depth increases, the survival rate of dark owls falls. Thus, in northern regions there has been strong selection against dark tawny owls, a selection that is directly related to climate. Here pale owls produce more fledglings in their lifetimes, carry fewer parasites, and are more resistant to disease. In fact, the only reason the darker form has not disappeared entirely from those areas is that the owls themselves mate indiscriminately, not necessarily selecting owls of their own colour. However, over the last several decades the Finnish winters have become warmer and snow depth has decreased. As such, one might speculate that there would be less pressure against the brown morph owls and that their numbers would increase. And indeed, that’s what the Finnish study shows. Using data from long-term studies carried out across Finland over the last 30 years, Dr Karell and his team found that the proportion of brown morph owls in the study population increased rapidly over the last 28 years and nationwide during the last 48 years. Brown owls now make up 50% of the tawny owl population in Finland, up from 30% in 1978. According to the Karrell, this is the first empirical evidence of climate-driven change in selection on a heritable trait. [i] C. D. Thomas et al., “Ecological and evolutionary processes at expanding range margins,” Nature 411, no. 6837 (May 31, 2001): 577-581. [ii] Joan Balanyá et al., “Global Genetic Change Tracks Global Climate Warming in Drosophila subobscura,” Science 313, no. 5794 (2006): 1773 -1775. [iii] Patrik Karell et al., “Climate change drives microevolution in a wild bird,” Nature Communications 2 (2, 2011): 208.